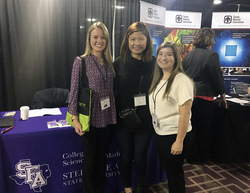 From left: Stephen F. Austin State University computer science major Lauren Kiefer of Dallas, visiting assistant professor Dr. Punitra Sawadpong and computer science major Jordan Barge of Houston represent the Department of Computer Science at the Women in Cybersecurity conference in Chicago. Students from Stephen F. Austin State University's Department of Computer Science recently attended the Women in Cybersecurity conference in Chicago. Dedicated to bringing together and supporting women in the field, the conference gave students the opportunity to sit in on technical presentations from major companies in the field and participate in mentoring sessions and workshops. "In the field of computer science and technology, even in 2018, women are still underrepresented," said Dr. Puntitra Sawadpong, visiting assistant professor in the Department of Computer Science. "When we look at the specialized field of cyber security, women are even more underrepresented." The conference provided women in cyber security a place to share knowledge and network, Sawadpong said. "The ultimate goal of WiCyS, and other conferences for women, is to encourage and welcome even more women into the field, create an opportunity for building connections among female professionals and students and provide a forum to discuss issues that can potentially affect us in the male-dominated work environment," Sawadpong said.